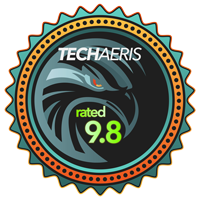 The Samsung CFG70 24″ Curved Gaming Monitor offers great colour and many options which make this an easy Top Pick of 2017 Award here at Techaeris. Curved monitors are definitely becoming all the rage lately. 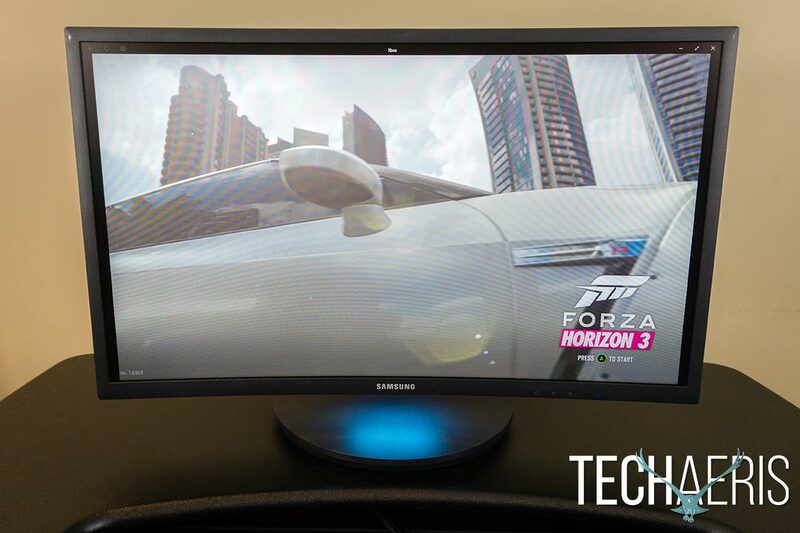 Our last review of a Samsung curved monitor didn’t fare as well as we hoped. This time we’ll be taking a look at another curved gaming monitor from the company. 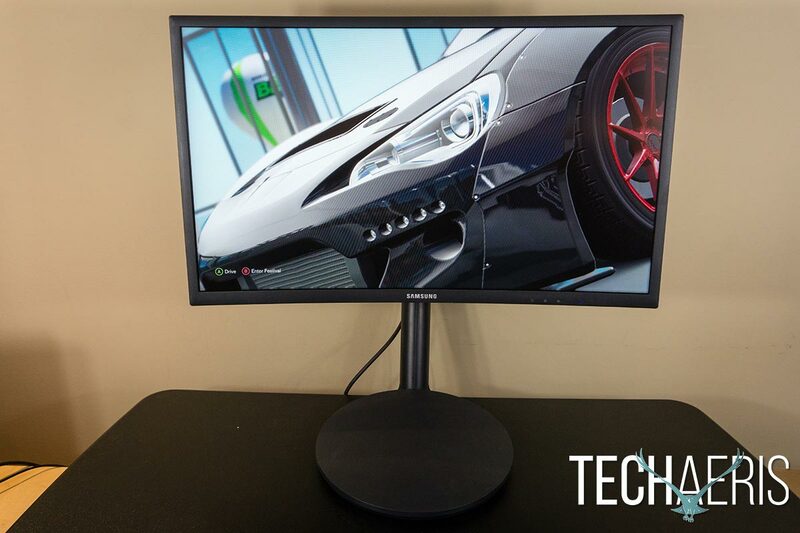 Our Samsung CFG70 24″ Curved Gaming Monitor review takes a look to see how it compares to its larger cousin. Product Weight With Stand: 11.5 lbs. Product Weight Without Stand: 6.8 lbs. 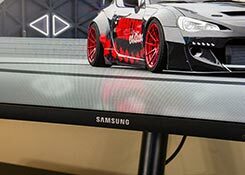 The Samsung CFG70 24″ Curved Gaming Monitor has a significantly different design than it’s 27″ CF591 counterpart. For starters, the monitor frame is black instead of silver — a personal preference but something I prefer much better. The monitor is fairly thin being roughly 3/8″ on the edges and flaring out to about 1 5/8″ thick on the bottom due to the illuminating light housed within. On either side of this light are a couple of vents with three game settings quick access buttons on the right side. 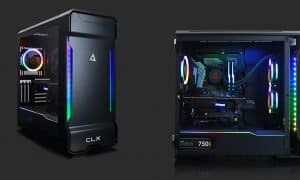 Pressing each one will change the mode and display Black Equalizer, Response Time, Refresh Rate, FreeSync, and Low Input Lag option statuses. Each button toggles a different Game Mode Setting and is something that probably could have been done with one button. The front of the monitor has a 1/2″ bezel along the top and sides and a 3/4″ bezel on the bottom. Centered on the bottom are the Samsung logo and graphic indicators for the Game Mode Settings to the right of that. Further to the right is a small blue LED light which indicates if the monitor is in standby or working mode depending on how you set it up in the menu options. 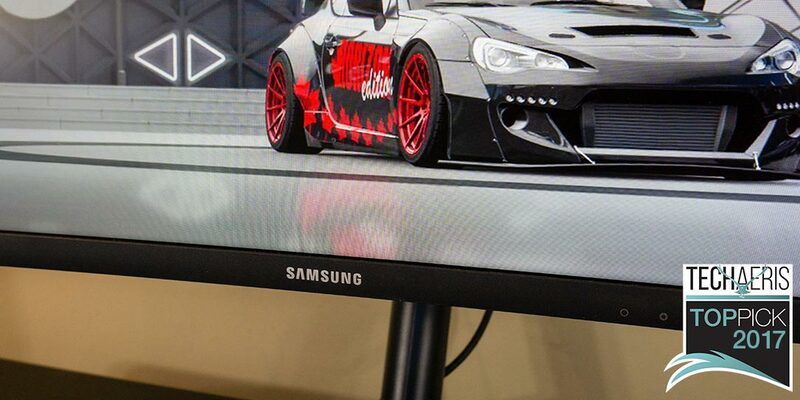 The Samsung CFG70 24″ Curved Gaming Monitor fully lowered. 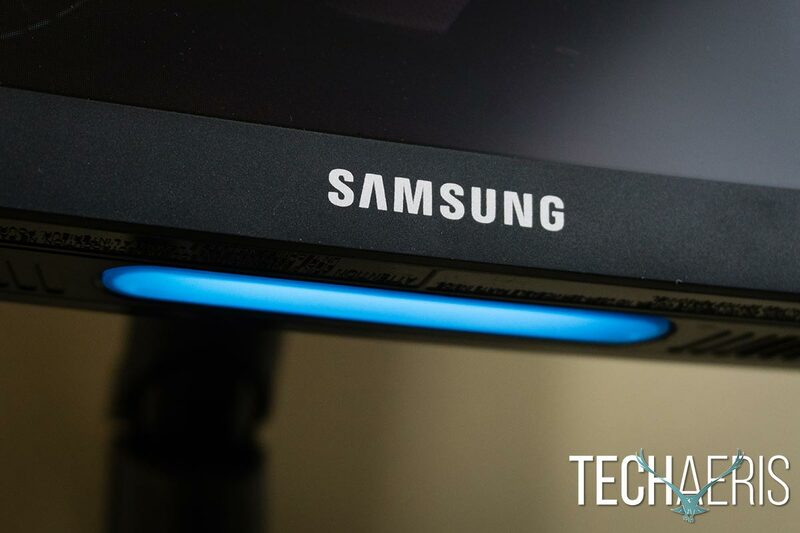 Underneath the Samsung logo on the front of the monitor is an LED light which glows blue. 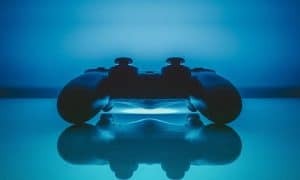 In the menu, the light can be toggled between three modes: off, blinking — which works at constant intervals, or interactive — which changes based on the game audio. It’s a nice little feature and adds a bit of extra light to your work area. The monitor also has an LED light which glows downward onto your desk. 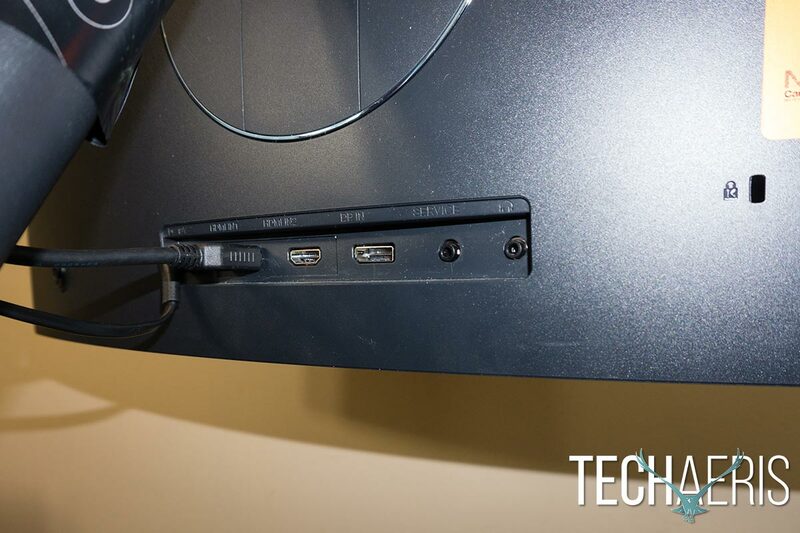 When looking at the back of the monitor, you’ll find the power/menu JOG button on the far left with your power, two HDMI in, DisplayPort, 3.5mm service, and 3.5mm audio ports. While the monitor doesn’t have onboard speakers, the 3.5mm audio jack works great if you want to use a pair of headphones or connect speakers to the monitor. 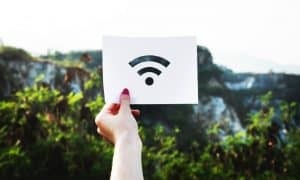 If you use a laptop, this might seem a bit redundant, but depending on your setup — especially if your desktop tower is under your desk — the 3.5mm audio jack on the monitor can be handy. The rear ports on the Samsung CFG70 monitor. The power/menu JOG button is an interesting feature which was also on the CF591 and a few other monitors I’ve seen. Pressing the JOG button turns it on if the monitor is off. If it’s on, pressing it brings up four options: Power off, Source, Menu, and Eye Saver Mode. Moving the toggle to the right will scan through the HDMI and DisplayPort sources. Moving the toggle to the left will enable or disable Eye Saver Mode. When this mode is enabled, it cuts down on the blue light so it’s great for using the monitor late at night. Moving the toggle down will power off the monitor while pressing it will exit out of the menu. Pressing up on the toggle will open the menu with its many options. 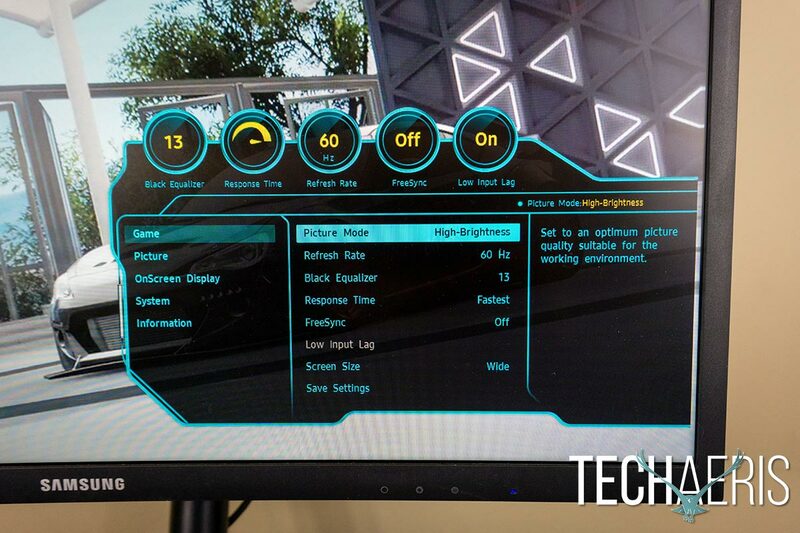 There are quite a number of settings that can be changed including Picture Mode (High-Brightness, FPS, RTS, RPG, AOS, sRGB, Cinema, and Custom), Refresh Rate (60/100/120/144Hz), Black Equalizer, Response Time (Standard, Faster, Fastest), FreeSync (on/off), Low Input Lag (on/off), and Screen Size (auto, wide, 4:3, 16:9, 16:10, and even 17″, 19″, 21.5″, 22″, and 23″ although I’m not sure why you’d want to). After adjusting the previous options, you can save them to one of the three Game Mode buttons on the bottom of the monitor. 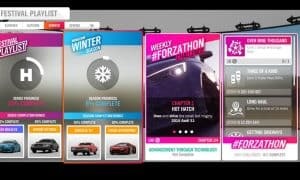 The on-screen menu and some of the options you can change. 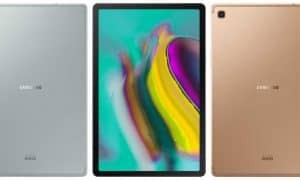 Other options you can adjust include brightness, contrast, sharpness, color, HDMI black level, screen adjustment, onscreen display language, display time, under screen lighting mode, audio volume, PC/AV mode, DisplayPort version (1.1 or 1.2), how source detection works, and when the power LED displays. As you can see, there’s plenty of control over the picture quality and more with this monitor. The base of the monitor is a circular stand with the arm connected to the back of the stand. One complaint I had about the 27″ curved monitor from Samsung was the lack of height adjustment. The CFG70, on the other hand, has a real slick dual hinged stand arm. This arm allows you to lower the monitor so the bottom is about 2 1/2″ from the top of your desk or raise it up to a height of just under 8 1/2″. This height adjustment also allows you to turn the monitor 180º so you can use it in portrait mode — which to be honest looks a bit silly in my opinion with this monitor’s 16:9 screen ratio. However, the option is there if you choose to use it. The monitor can be used in vertical/portrait mode as well. The dual hinged arm also allows you to tilt the monitor up and down, and also rotate it from left to right. 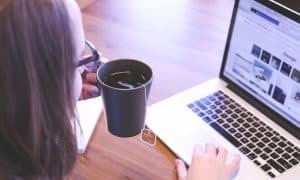 Once you’ve assembled it and placed it on your desk, you shouldn’t have to move the base at all in order to get the screen exactly where you want it. There is also a cable management piece just above where the bottom hinge is located which allows for some semblance of cable management. 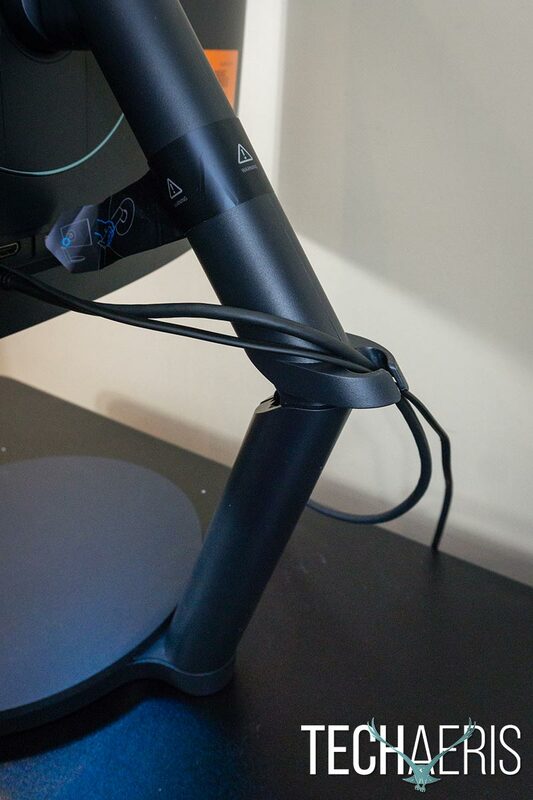 The dual hinged arm includes a cable management clip. 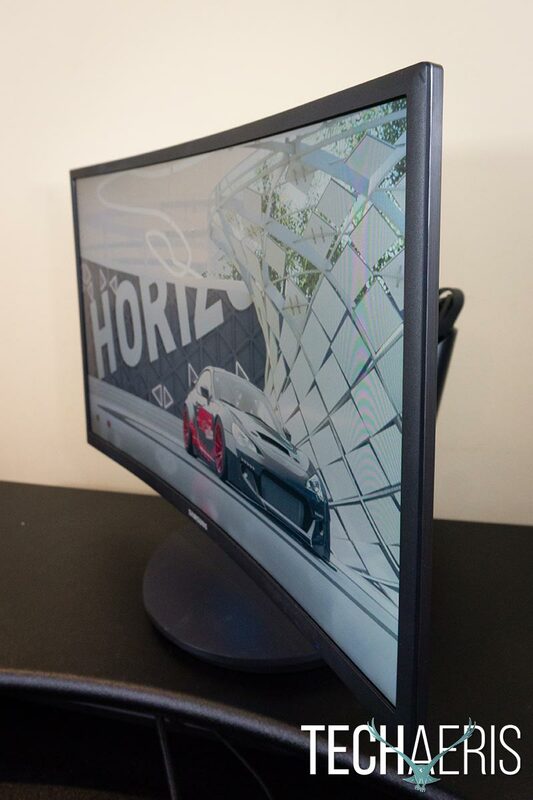 Overall, the Samsung CFG70 24″ Curved Gaming Monitor has a nice sleek design with plenty of functionality. The display on the Samsung CFG70 has a curvature of, 1800R which is pretty curved. For context, the human eye has a curvature of 1000R. While the curvature of the monitor doesn’t match the eye, it is quite nice once you get used to it. The Samsung CFG70 has a curvature of 1800R. While the 1080p resolution on the 27″ curved monitor had some issues, the same resolution on a 24″ monitor is quite perfect. My main issue with the CF591 was the lack of text clarity. The CFG70 doesn’t have this issue at all and text is nice and clear and easy to read. 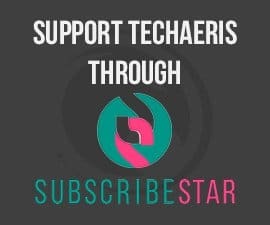 Colours are great, seem fairly accurate, and aren’t oversaturated out of the box, and there are plenty of options to adjust brightness, contrast, and other options allow you to easily fine tune it to your liking. In addition, there is next to no glare and the viewing angles on this monitor are fantastic. 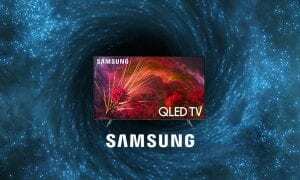 The Samsung CFG70 24″ Curved Gaming Monitor fully raised. The monitor works great with both HDMI and DisplayPort, and gaming is a treat with its onboard 144Hz refresh rate. Of course, you can toggle this between 60, 100, 120, or 144Hz in the settings but the higher the refresh rate means more frames per second being refreshed by the monitor. This isn’t the same as the frames per second you get in-game but does allow for smoother images and video due to the higher refresh of the screen. If you have an AMD video card, you can also enable FreeSync to have the monitor match the frame rate being output by your video card. The Samsung CFG70 24″ model has an MSRP of $349.99USD, which in itself is a fantastic value for this monitor. It is currently selling for $279.99USD on both Samsung’s website and on Amazon which really makes it a great deal if you’re looking for a smaller curved gaming monitor. 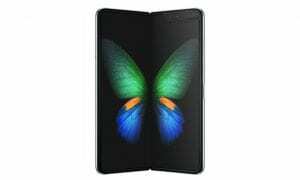 Samsung also has a 27″ version available — not to be confused with the 27″ CF591 I’ve referred to throughout this review — for $399.99USD if you’re after a slightly larger screen. The Samsung CFG70 24″ Curved Gaming Monitor offers great colour and many options including adjustable refresh rates at a great price which makes this a no brainer for a Top Pick of 2017 Award here at Techaeris. 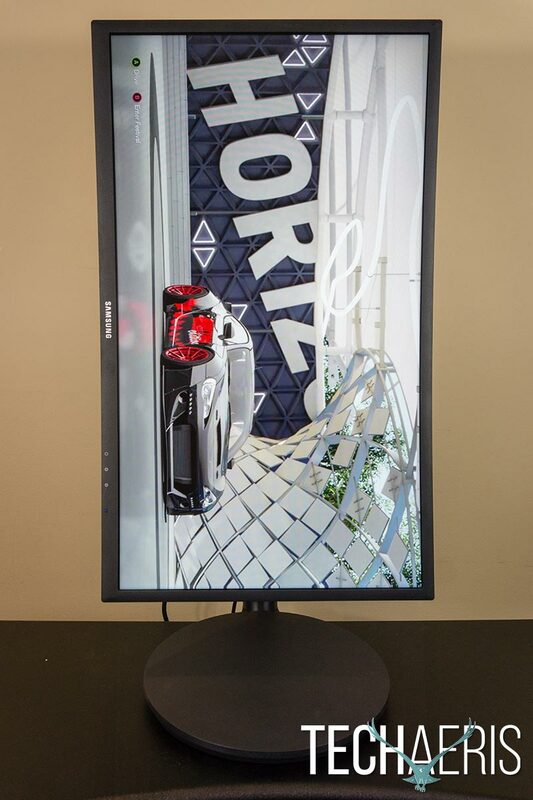 *We were sent a demo unit of the Samsung CFG70 24″ Curved Gaming Monitor for the purposes of this review. Not a huge fan of the behind the screen menu/power JOG button.